So I had this eggplant. One medium-sized eggplant. And these zucchini, a whole bunch of them. And I wasn’t cooking them, and every day I’d poke them to see if they had developed the dreaded soft spots that those veggies get shortly before they turn into produce bags full of mush and slime. (Sorry, that’s a pretty gross way to start a food post.) Eggplant I’d normally make into baba ganoush, but if I’m going to wash the food processor I want to be making more than a spoonful; my usual recipe calls for three eggplants and only one had come in my box. Zucchini I’ve been roasting all summer, and it’s been excellent and easy, but I was starting to get a little bored. So I went online to see what you could make with eggplant and zucchini. And mushrooms. I had this paper bag of mushrooms that I was also anxious to make use of before they left the edible zone. And the internet told me… ratatouille. Ah, ratatouille. Years of choking you down at Mediterranean restaurants where you were the only vegetarian option on the menu. And these were the eggplant-hating years, even. I look at ratatouille the way soldiers in the field probably look at their MREs. Pure sustenance, nothing more. Here are the problems I have with ratatouille: 1) It’s bland. It’s basically just a bunch of vegetables, cooked for a long time. Back in Provence in the 19th century or whenever it was invented, I bet that tasted amazing. But modern vegetables just don’t pack that kind of flavor wallop anymore, especially not tomatoes. 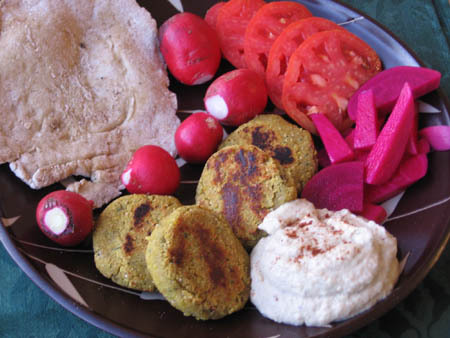 2) It’s usually served over couscous or, occasionally, rice. Because it’s bland, it doesn’t sauce up the grain, rather the grain pulls it even further into tastelessness. 3) The eggplant is ALWAYS undercooked, and therefore spongy, bitter, and unpalatable. Undercooked eggplant is the reason I hated eggplant. Now that I understand this I mostly only eat eggplant in three culinary situations: at home, where I control the cook time; in Chinese food, where they fry the heck out of tiny tender eggplants; in Indian food, where they cook the eggplant so long it’s barely recognizable as such by the end (mmm baingan bharta!). But that got me to thinking. Here I was with eggplant, zucchini, tomato, onion, and mushrooms (I wouldn’t have thought of mushrooms in ratatouille ’til I came across a yummy-looking variant online). I’ve loved eggplant now in many forms when I’ve cooked it at home (click the eggplant tag at the end of this post to see) so who’s to say that being the author of the experience couldn’t transform ratatouille the same way? Making the ratatouille took a long time because the each of the vegetables was first cooked separately so it could brown rather than steam. I believe the extra time is worthwhile in this case since that’s the very process that is going to transform your vegetables from bland, stewed mush to something more transcendent. It’s also important to me to make the distinction with recipes between difficult and time-consuming. This recipe is incredibly easy, just throw on an apron, turn on an audiobook, and chop and sauté and simmer your way to ratatouille bliss in a few hours. And bliss it was indeed. This ratatouille was delicious. Deep rich caramelized flavors and a heartbreaking melting texture. I ate it for three meals straight and then I put the last remaining bit into tacos for a some fusion fun. I could go either way on the mushrooms – if I had them on hand I would include them again, but I wouldn’t go out of my way to get them for this recipe, which I think would be excellent without them as well. I’m linking this recipe up to the weekly What’s In the Box linkup hosted by CSA blogger In Her Chucks. I love contributing my weekly CSA box-contents post to the linkup, but I also love when people post recipes they’ve made using their CSA veggies, so I thought I’d try out doing the same. Do check out the links – there are some seriously yummy things being made out there. This is a lightly adapted version of a recipe from The Kitchn, which is definitely worth checking out since it’s a real recipe from a genuine Frenchman, as opposed to my perhaps inauthentic – but delicious! – version. I originally made half a recipe because I only had one eggplant, and it worked out fine, but if I was planning on sharing this yumminess with anyone else I would make a whole recipe’s worth. Begin by peeling the eggplants and chopping them into bite-sized cubes. Put them in a strainer set over a bowl (or in the sink) and toss with a tablespoon of salt. Let the eggplant sit while you prepare the rest of the ingredients. Dice the onions. Warm a teaspoon of olive oil in a large (at least 5 1/2 quart) Dutch oven or pot over medium-high heat. Add the onions and a generous pinch of salt. Sauté until the onions have softened and are just beginning to brown, about 10 minutes. While the onions are cooking, you can cut up the rest of your vegetables. Keep them separate because you’ll be cooking in batches. chop the zucchini and tomato into bite-sized pieces, slice the mushrooms, and mince (or press) the garlic. When they have softened and begun to brown, transfer the onions to a large bowl. At this point The Kitchn offers some helpful advice which I followed liberally, using much red wine: During cooking, a brown glaze will gradually build on the bottom of the pan. If it looks like this glaze is beginning to turn black and burn, turn down the heat to medium. You can also dissolve the glaze between batches by pouring 1/4 cup of water or wine into the pan and scraping up the glaze. Pour the deglazing liquid into the bowl with the vegetables. So after you move the onions, go ahead and deglaze with 1/4 cup of red wine and then pour that off into the bowl with the onions. Add another teaspoon of oil to the pot and sauté the zucchini with a generous pinch of salt until the zucchini has softened and is beginning to brown, about 5 minutes. Transfer the zucchini to the bowl with the onions. Deglaze! Add another teaspoon of oil to the pot and sauté the mushrooms with a generous pinch of salt until they have softened and released their juices, about 10 minutes. Put them in your big veggie bowl. You know the drill – it’s probably time to deglaze! While the mushrooms are cooking, rinse the eggplant under running water and squeeze the cubes gently with your hands to remove as much moisture as possible. Warm another teaspoon of olive oil in the pan and sauté the garlic until it is fragrant and just starting to turn golden, which will only take a few seconds or a minute at most. Add the tomatoes, bay leaf, and herbes de Provence. As the tomato juices begin to bubble, scrape up the brown glaze on the bottom of the pan. Add all of the vegetables back into the pan and stir until everything is evenly mixed. Bring the stew to a simmer, then turn down the heat to low. Stirring occasionally, simmer for at least 30 minutes or up to 1 1/2 hours. Shorter cooking time will leave the vegetables in larger, more distinct pieces; longer cooking times will break the vegetables down into a silky stew. Remove the bay leaf. Stir in some chopped parsley if you like, or sprinkle some over each bowl when you serve it. Enjoy ratatouille alone, as a stew – not as a topping for something else. The Kitchn says: Leftovers can be refrigerated for a week or frozen for up to three months. Ratatouille is often better the second day, and it can be eaten cold, room temperature, or warmed. New roommate, new relationship, new school. There has been so much going on in the last few months! I’m so behind on blogging all the deliciousness I’ve been cooking and creating, and, ironically, my commitment to cooking at home as much as possible has been part of the reason I haven’t had the energy to blog. But as I’ve discussed in the past, part of the reason I lag on blogging sometimes is because I seem incapable of writing a post without making it a ten paragraph magnum opus. My life has been so incredibly busy I keep having the sense that I “don’t have time to blog,” which is only true if I let it be true. I keep taking pictures of food, I’ve mostly stopped doing any kind of post-processing on my photos and just throw ’em up as is, and if I keep my verbosity to a minimum the whole process shouldn’t take hours, the way it sometimes does. The way it often does. But that’s all in the past now. Maybe. At any rate, the intention of this blog is to serve as a resource for people who want to know what to cook with their CSA veggies and for people who want to know more about vegan, gluten-free cooking. I’d like to find ways to continue to do that, even amidst starting grad school, an overwhelmingly busy social life, and multiple other projects. So today, as my reentry to the magical land of food blogging, I bring you the best baba ganoush ever. The baba this recipe produces is in a whole ‘nother category from store-bought baba. I think the two main distinguishing features are the texture, which is smoother and more fluid than the paste-like version one often finds in commercial baba, and the unparalleled smokiness. If you’ve never had homemade baba (and you’re not one of those people who can’t stand smoky flavor) this stuff is going to blow you away! I make it as often as I can (hurray for eggplant season!) and it’s incredibly gratifying to whip up a huge tub of the same spread that costs $4 for a tiny 8oz container. The recipe I use is a David Lebovitz recipe, and I make it exactly according to his specifications and love it, but I do have a few notes. Normally in this case I would reprint the recipe here (with proper attribution and link) so that my notes and the recipe would be in one place (I find recipe notes tend to get lost if they’re on a different blog than the recipe I’m using) but David is very stern about wanting to be asked first, and that kind of time spent is what I’m trying to avoid right now in my new, keep-on-blogging regime. Plus his commentary in the post is quite witty and fun, so it’s good that you’ll get to enjoy that as well. 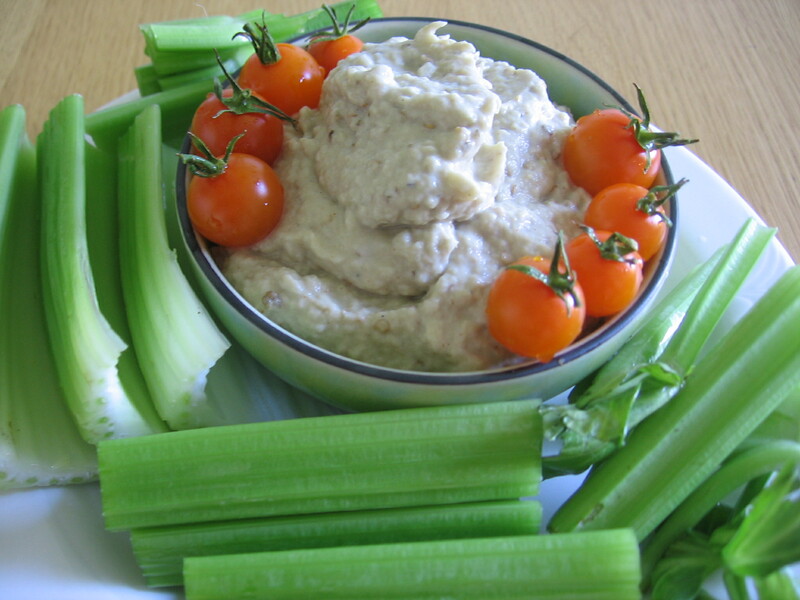 So, the Baba Ganoush recipe can be found here, on David Lebovitz’s blog. My notes are as follows: Like David, I also like my baba ganoush super smoky, and tend to char my eggplants on the gas flame until they are quite black all over. (Tongs are very helpful for holding the eggplants at the more awkward angles needed to char the bottom and top.) Unlike David, I don’t put cumin in my baba (this is optional in his recipe). I’ve never tried it, but it doesn’t sound good to my mouth. My final note is that sometimes I add considerably more lemon juice. I’m not sure if the other ingredients change in ways that demand more acid in the mix, or if my tastes are simply different from day to day. But I would start with the 3 tablespoons called for in the recipe and then after that add it to taste. 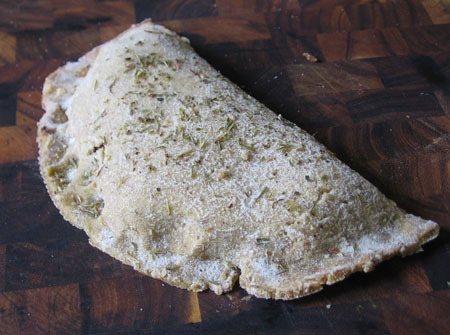 It has been a long-held dream of mine to make gluten-free hot pockets. I can’t even remember why anymore. (It’s sort of like what happened at the conclusion of the Great Dutch Oven Quest.) 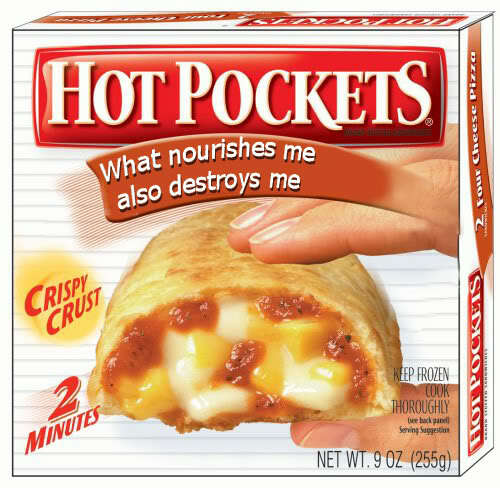 I’ve never even eaten a hot pocket of the Hot Pocket ™ variety. (Because, EW.) But the dream persists nonetheless. I’m really not a savory baker. (A baker of savory things? I like to think that I myself am fairly savory. If “savory” is the opposite of “unsavory.”) I don’t bake much bread – I’ve never baked a loaf of gluten-free yeast bread in my life. But I really like this idea of having a freezer full of hand-pies, delicious little meals that are all packaged up in their own goodness, waiting to be brought back to life by the toaster oven. I just had no realistic idea of how to make this dream come true. So when a friend showed me his newly purchased copy of Flying Apron’s Vegan and Gluten-Free Baking Book, and I thumbed through and saw they had recipes for several different kinds of “apron pockets” I got super excited and ran to reserve the book from the library. Many months later, my name had worked its way to the top of the reserve list and a copy of the cookbook landed in my hot little hands. After a few nights of contemplation and one trip to the farmer’s market, I knew what I wanted to put in my pockets. The actual project went smoothly (I even tracked down my never-used rolling pin!) 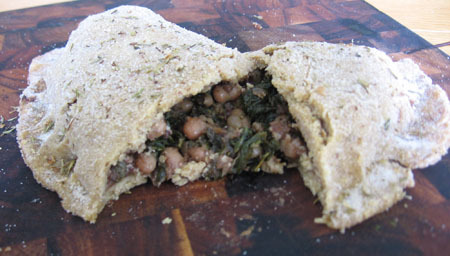 – the filling was just the right amount for the pockets, and the dough held its integrity while being folded and crimped. I popped them in the oven and when they emerged I could scarcely believe my eyes. There they were, the hot pockets of my dreams! And let me tell you – these babies taste SO good they almost didn’t make it to my freezer. I will tell you how to make the filling I chose and how to assemble and bake your pockets. And I’ll be delighted to hear how it goes if you try a different GF dough for the wrappers. I am so baking-ignorant that I have no idea if there are special requirements to make a bread dough serve double duty as a pocket-wrapper. Peel your eggplants and cut them lengthwise into slices about 3/4-inch thick. Sprinkle them with sea salt and set them aside to let the salt leach out bitterness from the eggplants. Chop the onion and garlic into large pieces and quarter the tomatoes. After 10-15 minutes of sitting with the salt, the eggplant should be exuding moisture. Blot with a paper towel and then cut the slices into rough chunks. In a large bowl, toss the eggplant, onion, garlic, and tomatoes with good-sized glugs of olive oil and balsamic vinegar. Sprinkle with the dried herbs. Stir to coat. Line a roasting pan with parchment paper (or oil the inside) and put the eggplant, onion, garlic, and tomatoes into the pan. Face the tomatoes cut side up. Roast in the oven until the eggplant is very tender – this should take an hour or more. Remove from oven and let the veggies cool. Put the eggplant mixture into a food processor with the olives, pulse until the mixture is mostly pureed. It doesn’t need to be completely smooth. Mix in capers and chopped parsley. Taste test for seasoning adjustments- more salt? Vinegar? Olive oil? Some pepper? Cover and chill until serving. Heat the olive oil in a large sauté pan over medium heat. Add the red onion and sauté until slightly brown, about 7 minutes. Add the garlic and continue to sauté for another 5 minutes. Add the mushrooms and herbs (fresh basil, dried oregano, thyme, rosemary) and cook, stirring occasionally, about 7 minutes. The mushrooms will have started to soften and release their juices. Add the navy beans and stir to combine. Stir in the frozen spinach (it’s okay if it is still a little frozen) and season to taste with salt and pepper. Cook, stirring occasionally, for about 7 more minutes. Take balls of your bread dough and roll them out on a countertop sprinkled with brown rice flour or other gluten-free flour. You want 6-inch circles of dough that are fairly thin but still hold together – the thickness of the discs will depend on the composition of your dough. 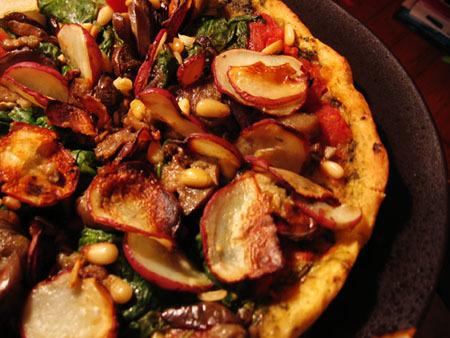 Spread a large spoonful Eggplant Caponata over the circle, leaving a 1-inch margin around the perimeter of the dough. On one half of the circle, spread 1/2 cup of filling. Using a large spatula or your hand (again, depending on how delicate your dough is), bring the other half of the dough up and over the filling. Seal the edges by crimping with your fingers. Carefully transfer the pockets to a well-oiled baking sheet. Brush the tops with olive oil and sprinkle each pocket with dried herbs. Bake until the thickest part of the pocket is firm and beginning to brown, about 30 minutes. This took more like 45 minutes for me. Eat and enjoy your hot, savory deliciousness! This week I tried to check out Veganomicon a bit more for inspiration, but I still get the feeling I might be happier with their previous book, Vegan with a Vengeance, since all the “basic” recipes I look for – tofu scramble, chocolate chip cookies, etc. – aren’t in the fancier V’Con because they already appear in the humbler first effort. I think that was a poor choice on the authors’ (or publishers) part. By including all those basic recipes in V’Con, they could have created a book that would be the cooking bible, the Joy of Cooking for vegan folks, but instead their big book is just one more on the shelf. We have switched our Farm Fresh to You CSA box to a smaller size because we were getting a little overwhelmed, but we did a good job this week of using up all the veggies that came, even the lettuce, which is usually our downfall. Duck has also been volunteering at the food bank in our neighborhood, and they always insist on sending him home with some nice organic veggies, so those informed our meal choices this week as well. Last night I rediscovered a huge bunch of gorgeous black grapes that had gone past the point of eating raw (Duck and I like our grapes very, very firm) but were in no way rotten, so I tried something I’ve never done before and improvised a little gluten-free, vegan grape cake. It turned out a bit more like a grape bread pudding, but it was delicious! This week’s menu post is light on recipe links, but that’s because the potato leek soup, the biscuits, and the tofu scramble were all first-tries and all disappointments. (Not so bad that dinner was ruined, but I wouldn’t recommend the recipes to anyone else.) If anyone knows a recipe for fantastic vegan, gluten-free biscuits, let me know and I will be forever in your debt! For a massive dose of menu plans, check out the giant Menu Plan Monday compendium over at OrgJunkie. The Gluten Free Menu Swap is hosted this week by Asparagus Thin, with the theme of Superfoods. I got to feel all smug and healthy at how many superfoods from her list I used this week, and not even intentionally to meet the challenge. Avocados, chick peas, dark leafy greens, eggplant, flax seeds and hemp milk in the cake, garlic in everything, lots of nice fermented and sprouted soy, sweet potatoes, tea, whole grains, and yogurt – nearly her entire list! Have a great week, everyone! And, if you have a favorite Bean, Lentil, Legume, or Pulse recipe, don’t forget to send it to me for the Steady Pulse round-up! As if it wasn’t enough that we completely denuded her home in the name of the ultimate vegan, gluten-free Thanksgiving (sorry, Mom! we’ll get your chairs, tablecloths, candlesticks, cushions, serving dishes, silverware, bowls, dessert plates, and glasses back to you soon, I promise. No more eating from mixing bowls! ), my mom also brought our Thanksgiving table to life with a gorgeous “only in California” centerpiece made from a bounty of local, seasonal produce. A centerpiece artist extraordinaire, she didn’t know what colors and themes would be called for, or how much space we would have (not much, as it turned out – we had to use three improvised sideboards as it was to hold all the food), so she arrived at our place bearing many bags of handsome fruits and vegetables. She ended up going with a striking theme in purples and greens that people commented on all night and long after the event, and I ended up with so much produce it was like getting two CSA boxes (at least!) at once. So there was a second Thanksgiving feast after the first, only this one was composed entirely from the centerpiece! Leftovers from the big dinner got us through the weekend with house guests, and then it was time to turn my attention to all the beautiful bounty slowly wilting in the middle of the table. I wisely turned for inspiration and guidance to my favorite food bloggers, and they did not lead me astray. Technicolor purple cauliflower and fluorescent green fractaled romanesco went into the roasting pan to make Roasted Cauliflower Soup from FatFree Vegan Kitchen. I made the soup exactly as directed, although my truffle oil had gone rancid (it was a stocking stuffer given to me a while ago, so it’s not like I lost a big investment, phew!) so I couldn’t add that note at the end. It definitely needed a hint of fat for flavor and mouthfeel – I tried toasted walnut oil and that worked pretty well, but any more than one or two drops would have overwhelmed it. Generally, though, the soup was very good. I really just have to learn that I can’t use romanesco in recipes that call for cauliflower. It’s too dry and tough, for one thing, and too bitter for another. Had I made the soup solely with cauliflower I imagine it would have been silky smooth but because of the darn romanesco it never got beyond a nubby puree. The color was pretty, though, fading to grey-brown when cool but warming back up to a dark lavender. Eggplants featured prominently in the centerpiece, ranging in color from beautiful white and pale purple to the deep purples so dark they were almost black. The week before Thanksgiving we made a big batch of benghan bharta, our favorite eggplant dish of all time, so I wanted to try some new recipes this time. 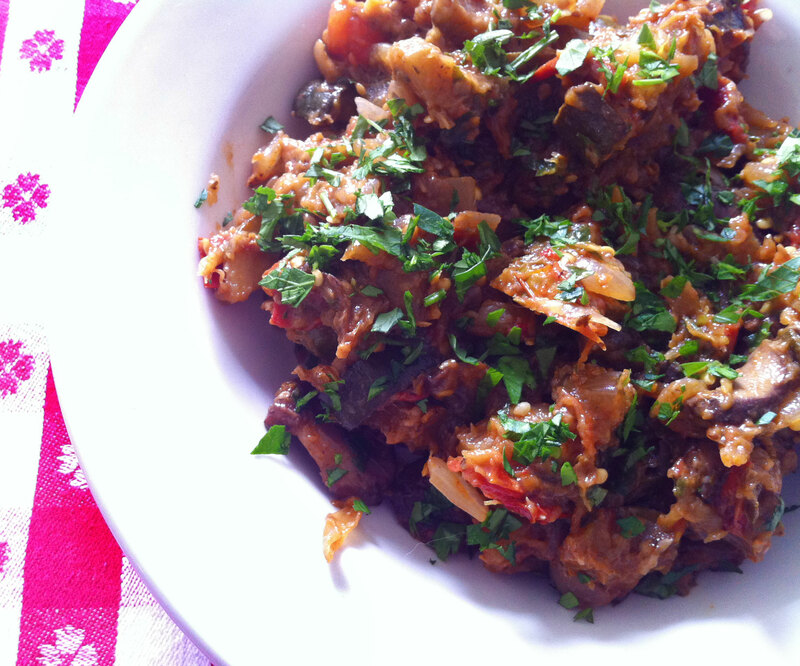 Karina, the Gluten Free Goddess, had a recipe for Eggplant Caponata that sounded really, insanely good. I even had olives in the house, which I never usually do ($8.99/lb at Rainbow Grocery, no thanks! ), from the fancy olive assortment my mom brought over for appetizers. I roasted a fraction of my eggplant supply and whipped up Karina’s caponata in the food processor. My gut instinct was not wrong – this stuff was really, insanely good. Duck and I basically had it as our complete meal, with crackers, for several meals in a row. I used canned tomatoes rather than fresh because tomatoes aren’t in season here right now, and that did not hurt a bit. The spread was too sweet for me, though, so I would probably skip the agave nectar next time, or at least taste the spread before adding it. I hated eggplant for most of my life and refused to eat it, until a few years ago I had some amazing, life-changing (in the eggplant department at least) eggplant pakora (eggplant breaded in chickpea flour and deep fried) pushed on me by the exceedingly interactive owner of our favorite local Indian restaurant. Once I became willing to try a little eggplant here and there, the dish that probably converted me from eggplant hater to full-time eggplant eater was Nasu Dengaku, grilled or fried eggplant with miso sauce. The eggplant is cooked until it melts into the softest, smoothest texture, and then it is broiled with a sweet-salty-sticky-yummy miso sauce on top. I’ve been wanting to try making Nasu Dengaku (Broiled Japenese Eggplant with Miso Sauce) at home for a while now. Earlier this month I tried a recipe from Mark Bittman’s How to Cook Everything Vegetarian that involved pan-cooking the eggplant rather than grilling or frying it, but it didn’t turn out well at all. (Partly this was because we only had extremely assertive red miso for the sauce, rather than the traditional mild white miso. But the texture was all wrong, anyways.) This time I turned again to Fat-Free Vegan Kitchen, for a recipe that involved broiling as the main cooking method for the eggplant as well as for the traditional miso-sauce-broil. The recipe uses agave nectar rather than sugar, which I think is great. I’ve made sushi at home for years, but when I first started preparing Japanese food other than sushi I was shocked to realize how much sugar is used in nearly every preparation. It even goes into sushi, too, as a component of all the cooking liquids that vegetables and mushrooms are simmered in to prepare them for rolls. I made the recipe for Nasu-Dengaku exactly as directed, with one very notable exception. Rather than taking 3 minutes per side in the broiler to become tender, I would say my eggplants, which look to be the same size as the ones Susan uses, took more like 12 minutes, or more, per side. Who knows what wacky differences there are between broilers – the broilers on an electric oven, a modern gas oven, and an antique gas oven (like mine) aren’t even the same appliance – they just share a name. Once they were cooked through, however the broiling time for the miso sauce was perfect as given. The final result was perfect! Exactly what my mouth was imagining! Make sure you have the right eggplants-to-mouths ratio so they can be eaten right away, however. They did not make good leftovers, sadly. Well, now… the bounty from the centerpiece was so generous that I’ll have to complete my tale in another post. Stay tuned for artichokes, kale, and more! Sometimes everything your boyfriend brings home from the farm is so yummy the two of you just have to cook it all up and throw it into a delicious, to-hell-with-gluten-free-eating Vicolo cornmeal pizza crust and you have to eat every bite because it’s just that darn good and you’re probably not allergic to wheat, anyways, right? Right. What are other peoples’ secret glutenous temptations? French bread? Chocolate cake? Oreos? Mine is Vicolo cornmeal pizza crusts, which with a name like that should be gluten-free but sadly the first ingredient is wheat flour. But there’s just nothing else like them. I dream of their crunch, their heart-meltingly good flavor, bold enough to stand alone, tender enough to cradle and enhance all the lovely things Duck harvests from the ground. Crisp slices of grilled eggplant, garlicky sauteed spinach, barely toasted pine nuts, oven-baked new potato slices, homemade vegan basil pesto, and diced tomatoes from a tin. Each ingredient on this pizza demanded its own cooking method (not counting that not-particularly-laborious stint with a can opener) but it was so worth it to have each vegetable singing out at its very best.